Lin Mengmeng (Deng Jiajia), the daughter of famous, wealthy and arrogant entrepreneur Lin Tai (Sun Honglei), is accused of having killed her stepmother, a famous singer called Yang Dan, after confronting her over her infidelities to her father, made public in a paparazzi video showing her having a one-night stand with an actor. Lin Tai claims his daughter is innocent and hires China’s highest-paid lawyer, Zhou Li (Yu Nan), while public prosecution is handled by Tong Tao (Aaron Kwok), a brilliant lawyer with a spotless record, who’s been trying to nail Lin Tai for years over finally unproven charges of fraud. But after CCTV footage and a key testimony lead, on the first day of the highly-publicized trial, to the slightly too convenient conclusion that the father’s driver is the actual culprit, the truth starts to unravel as both defense and prosecution claw to the truth and receive clues from a mysterious source as to what lies beneath the clear-cut appearances. 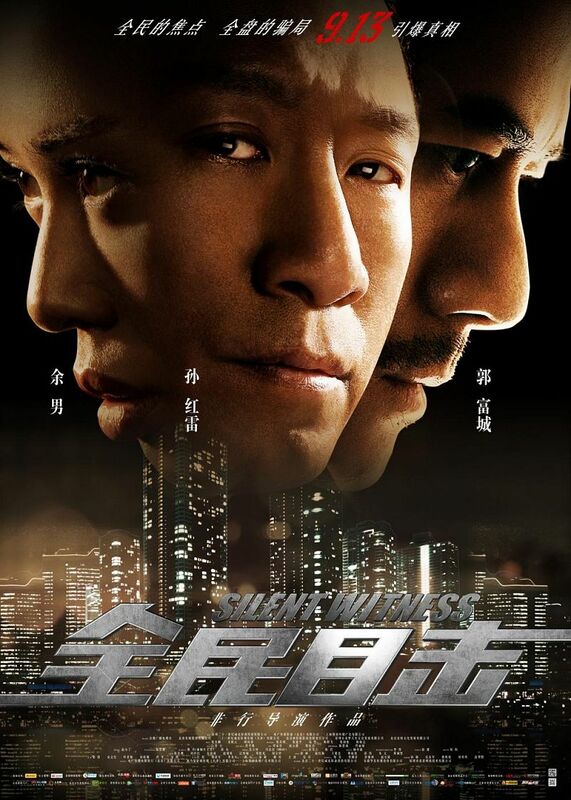 Courtroom dramas aren’t Chinese cinema’s most well-trodden genre, and so it comes as a minor surprise that writer-director Fei Xing’s Silent Witness (one of two films of that genre to come out in 2013, the other – also starring Aaron Kwok – being Charlie Yeung’s directorial debut Christmas Rose) is such a well-rounded, narratively potent film. One of the film’s main assets is its fairly airtight script, which interestingly reboots itself three times, each time rewinding to the film’s starting point outside the courtroom to show the same sequence of events from three different points of view, and each time redefining or adding layers to the characters’ motivations. While it often verges on bloated self-importance with some grandiloquent effects, such as an over-the-top score hammering every point home, detracting from the overall sense of realism, Silent Witness nevertheless benefits from a towering central performance from Sun Honglei who anchors the film with a complex and charismatic performance. Such is the nature of his role that his demeanor in various scenes that are replayed throughout the film has to be interpretable in different ways depending on what the audience knows at that point; he acquits himself brilliantly and with a superb sense of knowing showiness. Providing excellent though less flashy support are Aaron Kwok and Yu Nan, the former slightly too stiff in a fairly one-dimensional role, but still laudably intense and restrained, finely playing off the latter’s steely but subtle turn. Some reviews have called the film’s redemptive ending (which comes after much of the film’s runtime exploring the darkness of the human soul) a jarring distraction and an unfortunate concession to China’s censorship. But we feel that may be unfair. The State Administration of Radio Film and Television (SARFT), which enforces film and television censorship in China, doesn’t ban grim endings, as long as any moral deviant gets his or her due (see Johnnie To’s state-approved Drug War for proof), so the redemptive nature here can be seen as a genuine artistic choice on Fei Xing’s part, and while not entirely convincing, does carry a real emotional resonance. Where is Kirk Wong ?